Human factors (engineering) started as a solution to a practical problem, namely the challenges to human capabilities that came from uncontrolled technological developments. The practice of human factors was from the beginning justified by various theories about human functioning, specifically the analogy between humans and information processing machines. Through the following decades the dependence on theories increased so that we today are inundated with methods and solutions that are intellectually attractive but with limited practical effects. 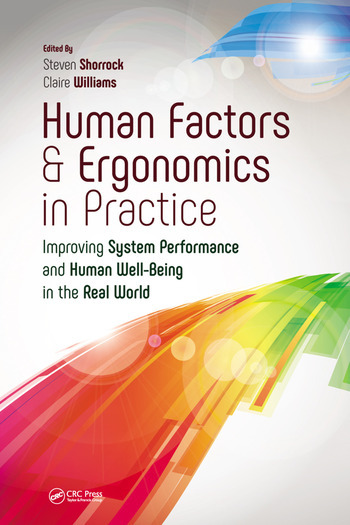 This chapter provides a condensed survey of this development, and argues that human factors as a practical solution should be based on a small number of simple principles with a strong empirical foundation. In this chapter Hollnagel makes an eloquent and strong argument for the more pragmatic human factors of yesteryear. It’s an argument that will resonate well with practitioners and those seeking to influence systems ‘in the wild’. This argument has been made many times in the past, reference is made to both Neisser and Broadbent, although it’s an argument that is normally made during informal conversations that typically start with questions like which journal papers do you read? or what do you think about the latest few methods proposed this month? For pure academics, developing a new method is an attractive endeavour. Aside the opportunity to come up with a new acronym, it’s a great opportunity for fame and recognition within our discipline. Many in our field have built an entire reputation, and even whole companies, on the back of a new method, model or framework. For those whose focus is more programmatic and measure their value by their ability to improve real work conditions, the proliferation of methods can, in most case, be viewed as insignificant and other times frustrating. The key difference is that models are viewed as tools. More specifically, as a means of making a transition between opertunities for improvement collected via observations of the world and interviews and tangible change of that environment. In reality, there is a third group, to which most of us would self ascribe, that finds common ground with both camps. Retaining a keen interest in theory alongside a desire to positively shape the world. As a member of this group, it was refreshing to see the thesis of many of the informal conversations articulated in this chapter. It was also great to be reminded that this is an issue as old as our discipline and that many of the great names have voiced similar concerns over the years. Despite many attempts to in the past, and initiatives such as workshops and research funding mechanism to encourage collaboration, the gulf between research and practice seems to be as wide as ever. The individual goals of academia (publication records) and practitioners (efficiency of delivery with minimal risk) create a wedge between them. Skepticism aside, it is clear that the gap between academia and practitioners is being bridged, albeit by a smaller group within our community. The obvious question then becomes what more can be done. For practitioners, perhaps the simplest and most impactful intervention would be to pause more throughout a project. At the start to develop a bespoke approach, investigating new and different methods. And then periodically revisiting this approach through the design to confirm its applicability. For academics, the intervention may need to be more systemic. For a greater proportion of projects, the measure of research sucess needs to be aligned to its utility and level of practical transfer. There will, of course, always be a place for theoretical study and more methods; however, an emphasis should be placed on a dialogue with practitioners to ensure the outputs of research can be adopted. There is so much written in the literature (articles, books) on human & organisational factors (H&OF) that one question is “what’s in there for practitioners?” What to extract from the wealth of data, case studies, methods and theories to help practitioners who are not expert in this field? What can managers, engineers or operators in high risk systems keep in mind which is practically helpful to them? This is precisely what Erik Hollnagel does in his chapter: identifying simple human factors principles. He retains 5 of them: ‘trade-offs and workaround’; ‘the minimum action rule’; ‘form should match function and vice versa’; ‘what you look for is what you see’ and ‘show what is going on’. What is interesting about these principles, is, despite their very simplistic content, that they often need to be reasserted in the context of management emphasis over behaviours and proceduralisation, something that appeal also very much to the regulatory mindset, i.e., compliance. The fact is that simple principles, such as the ones above, and Erik Hollnagel’s ones, are sometimes ‘simply’ neglected. Hierarchies, complexity of organisations, time constraints and an array of other factors contribute to make them inoperative. This is very much what H&OF specialists, whether as insiders or outsiders of high-risk systems, struggle with on a daily basis. As a human factors engineering practitioner, I like to think of myself as representing the human in an engineering process which is usually focused elsewhere. I have found that successful human factors integration requires us as practitioners to be involved from the outset and as the nature of our work requires us to work with or within multi-disciplinary teams, effective communication is also essential. It seems that engineering systems are becoming increasingly more complex and in some cases, constantly evolving, making them difficult and time consuming to fully define. But in my experience sometimes it is not about the perfect human factors solution, obviously as practitioners we do our best with the time and resources allocated to us to identify the issues. However the potential engineering solution usually requires us to “manage of the grey area of acceptability” in so far as, that there are usually trade-offs required to gain acceptance. This entry was posted in Part 1: Reflections on the profession and tagged accidents, affordance, cognition, design, history of HF/E, methods, principles, research application, research-practice relationship, theory, tools, trade-offs, workarounds. Bookmark the permalink.